We said goodbye for now to our daughter in New Haven and are making our way up to Concord, New Hampshire. But we didn’t go far, only about 50 miles. We can’t make this trip without stopping at our favorite casino, the Mohegan Sun. 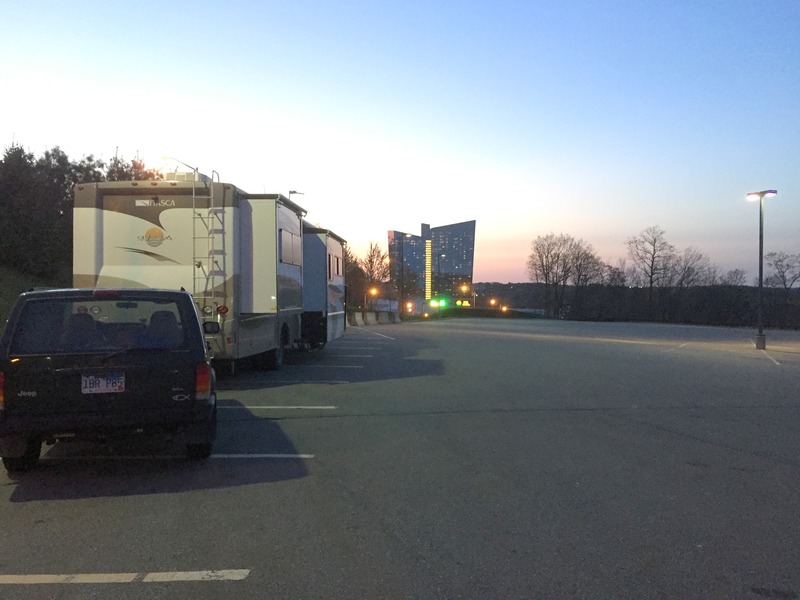 They have a large free parking lot just for the RVs, far away from the buses and trucks, and a shuttle cruises by every 20 minutes to pick up anyone who wants to go into the casino. This is the largest casino that we have ever seen and it’s beautiful inside. And there are lots of shops and some wonderful restaurants. If only I could eat that much! We’re only staying one night here, continuing up north in the morning. This entry was posted in Connecticut, Daily Post, May and tagged Mohegan Sun Casino. Bookmark the permalink. We love the Mohegan sun also wonderful placed. Also love seeing your post We just bought our RV last November our first trip was to Florida`s west coast. We have been going Conn. and up in that area for years staying with relatives. but now we plan to camp more and hopefully travel more like you guys.